We had bought a pre-owned 2009 model Alto 800 in 2011. In the last 2.5 years it has given a niggle free experience over 33000 KM's, with the current ODO reading nearing 51000 KM's. 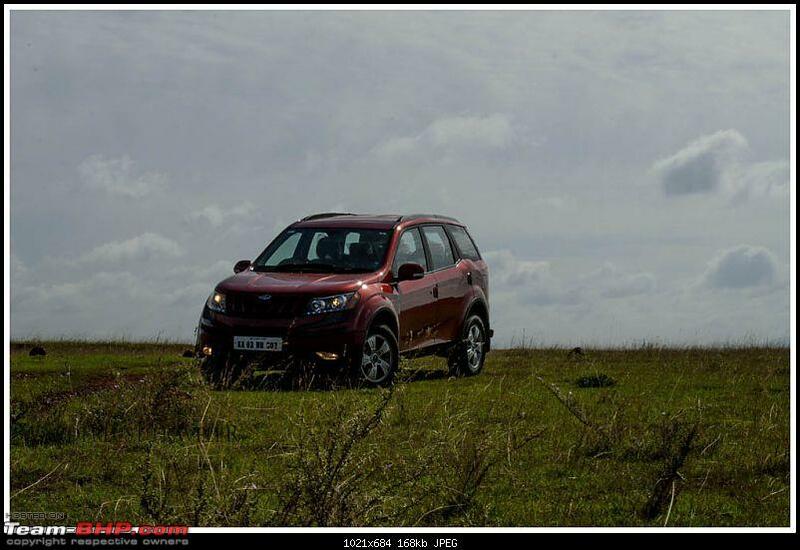 However its lack of basic safety features and limited engine power output is something which is in back on our mind every time we take it out on the highway and this was the reason, which made us look out for a new vehicle. Before starting the review I should say that I am a Maruti fan boy, almost all the cars owned in the family has been a Maruti. Apart from Alto, most of the cars driven extensively by me were tall boys or SUV (Ritz, Omni, Eeco, Scorpio). I am what you can call an old school driver, learnt basics of cars and driving on HM Ambassador (Mark II) and Premier Padmini. Premier Padmini was my teenage ride, which I used to gleefully jump into at pretext of dropping off any relatives. I am of the view point that cars should use their brains only for safety related functions (ABS, Airbags, ESP etc), auto functions (Auto wipers, auto headlights etc) does not excite me. Even parking sensors are not must have features for me (I am more comfortable craning my neck and getting visual instead). In other words between the car and me, I should be the brainy one. Since this will be my second ride (we plan to keep our Alto for city drives) mileage is not a primary point of concern, though we were looking only for diesels since the vehicle will be used for long distance travel. Also I am one who follows the 'There is no replacement to displacement' point of view. Mentioning the above points since my car selection may be biased due to these. ABS, dual Airbags - I guess it would not be required to give a reason for the same. Descent grunt for engine - On highways I am not a person who cruises in triple digit speeds. However an engine which has sufficient power to perform an overtaking maneuver without breaking into sweat was one of the primary requirement. Rear windshield de-fogger - I feel this is a important but often ignored feature. Since most of my driving is around KL and KA, which sees rains for good part of a year this is a must have feature. Diesel burner - With an average running of around 1200 KM's per month it is debatable if the preferred fuel option is to be petrol or diesel. However apart from hatchbacks most of the diesel cars are having their actual mileage at-least 3~4 KM's more than petrol variants which made me look out for diesel engine options only. Hyundai Verna - Value for money option. Positives -	Packed to the brim with features. Negatives -	Even with the suspension upgrade, combination of light steering and soft suspension was bit un-nerving. 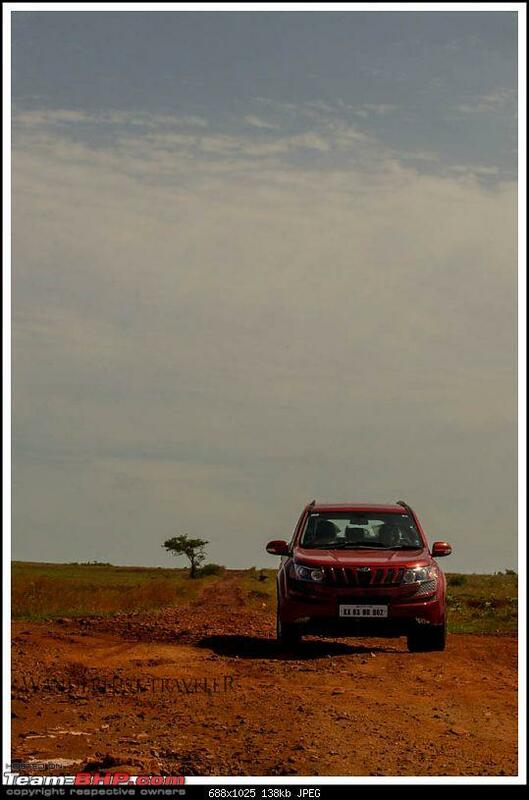 Ground clearance when fully loaded was an issue, especially in craters of Bangalore roads. I am not much a fan of the fludic design. Call me old school, but I am fan of the clean cut design of Vento. Negatives -	VW service center reviews were not confidence inspiring, somehow felt they washed hands off claiming their so called superior German engineering was not able to cope up with Indian fuel and conditions. Negatives - Same as Vento and also as a longtime reader of TBHP, Skoda stories does not inspire much confidence. Super mileage and flexibility of 5+2 seating. Positive reviews on ownership threads, owners vouch the DDIS in 90 BHP tune is able to effortlessly cruise along highway. 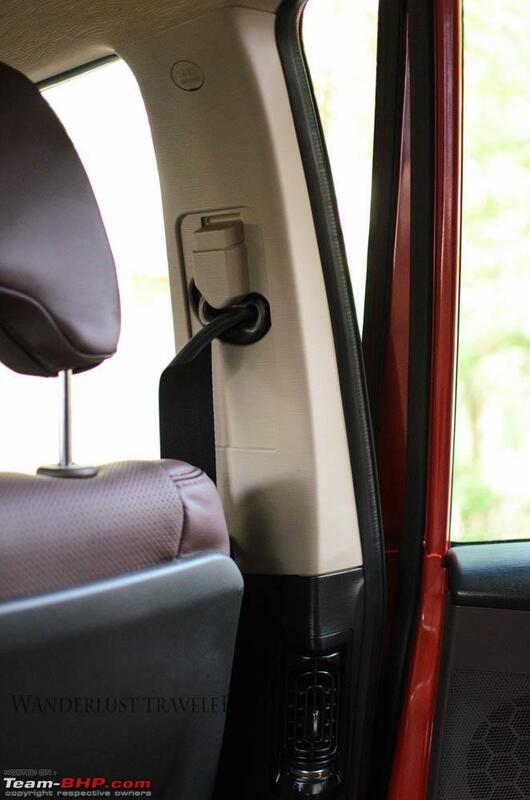 Though quality of material used is good, the all beige interior is a dust magnet. Maruti SX4 - Definitely male, albeit a bit older. Though dated, fan of the design. Never sold as a Maruti should have, hence perceived as a failed model. Along with younger brother Ertiga, shares the smaller Engine. Positives-	Another Japanese known for reliability. Combination of bigger engine and great mileage. Negatives -	Compared to earlier generation vehicle, this one looked like a cost cutting exercise. 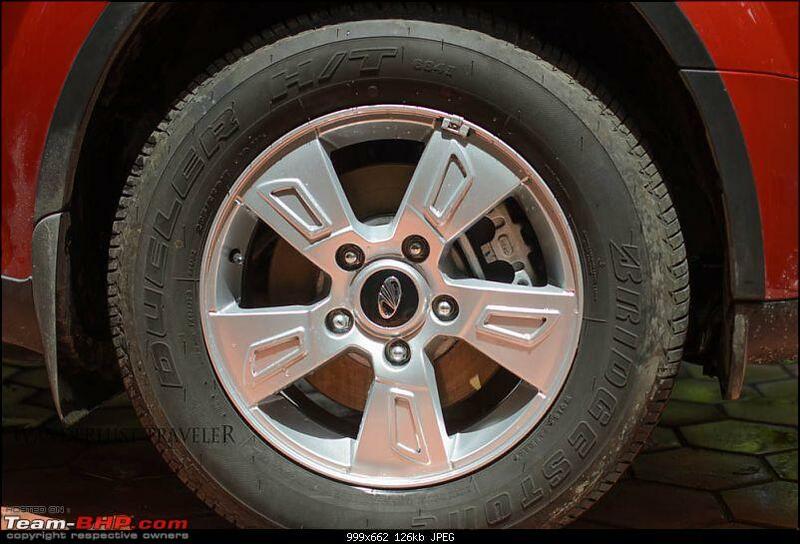 Tyre too skinny, would need an upgrade straight from showroom; Means increased cost. 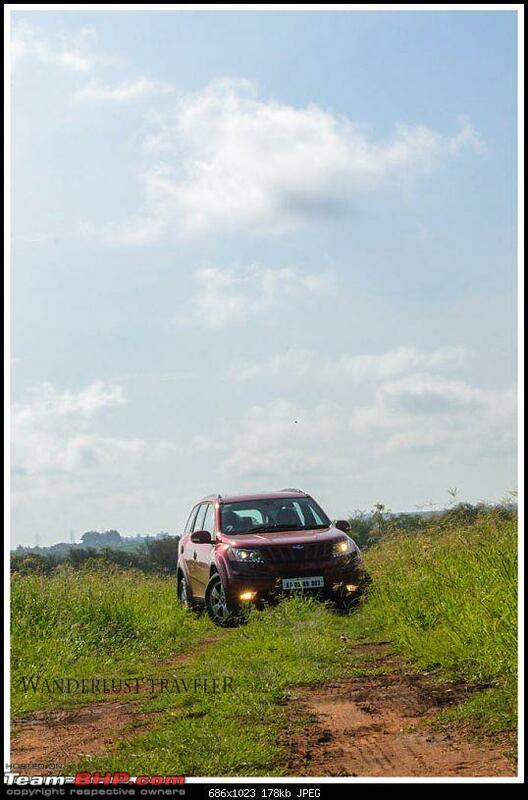 Renault Duster - Theoretically the ideal vehicle. Positives -	Combination of great road manners, good ground clearance and frugal engine. 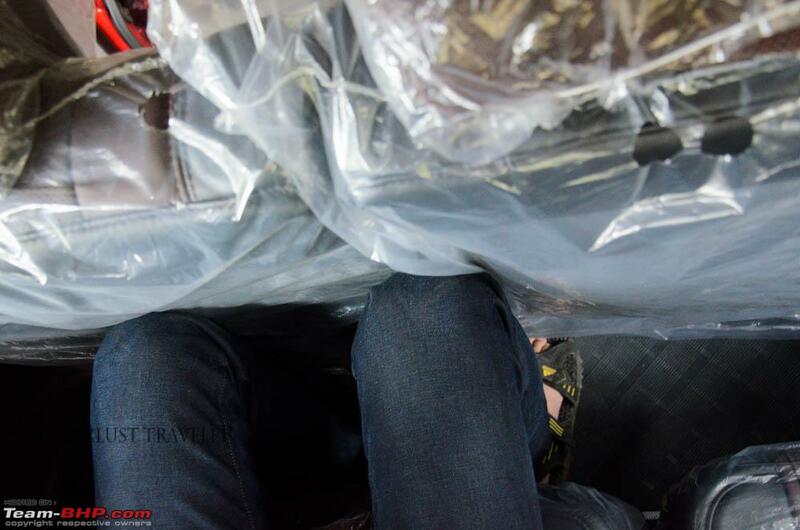 Crossover means higher seating position. Negatives -	Had always felt Duster was overpriced by at least 2 lakhs. Renault's service network was not that confidence inspiring, more so since Duster is their one trick pony. Interiors were nothing to talk about. Nissan Terrano- Duster's expensive cousin. Nissan has a brand value almost similar to other Japanese brands in KL. Those who drive Nissan overseas, vouch for its reliability. Looks more modern than Duster. Negatives -	Nissan's long term commitment to India was a question to me. Heck they didn't even have service centers under them till couple of months back. Though with Nissan branding, it is a Dacia launched by Renault and re-launched by Nissan. Tata Safari - First love. Positives -	Great ride quality and driveablity. Negatives-	Safari Storme looks a bit tacky with an overdose of chrome. TATA's after-sale experience stories are not confidence inspiring in general. 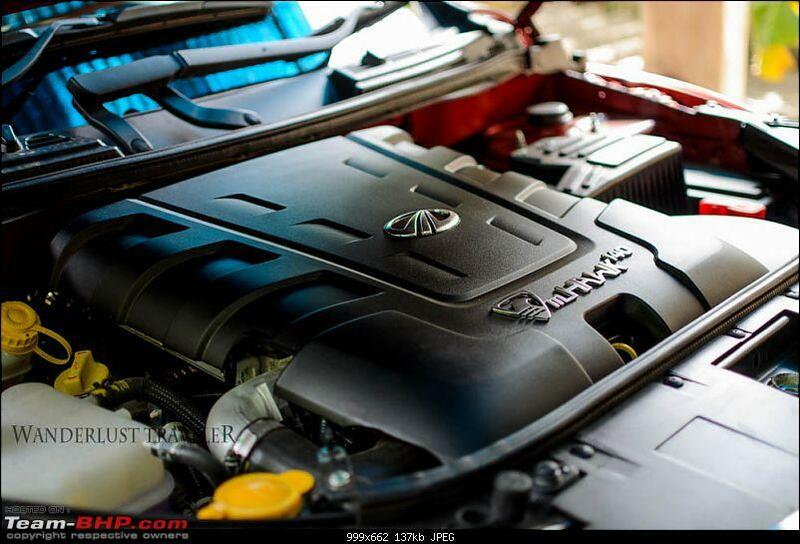 Positives -	Superb engine, top end variant almost same price as that of B+ sedan. Current model relatively niggle free, update expected soon. Negatives-	Highway handling not confidence inspiring. Mahindra after-sales is a hit or miss. Positives -	Feature packed, excellent driveablity. Safety features - ESP, 6 Airbags, ABS on top end variant. Difference between W4 variant and B+ sedans cost wise is marginal. Negatives-	A newbie member will become senior BHPian by the time he/she reads entire XUV niggles thread. Mahindra after-sales not confidence inspiring. I was seriously considering on Vento till couple of my friends who own VW suggested me against dealing with VW. Anyways SUV's fascinated me, so the crossover brothers (Duster & Terrano) were the next to be considered. However did not feel Duster to be value for money and was bit apprehensive about Terrano due to ongoing Nissan dealership legal issues. Around start of 2014 start there was news of Maruti launching XA Alpha or SX4 crossover, hoping some news about that, thought of waiting till Auto Expo. However there was no news about XA Alpha which Maruti showcased in 2012 Auto Expo. Later news reported that SX4 cross will be launched by 2015 start and may come with 1.6 D engine. It was a dilemma if to wait till Maruti launched the product and make a decision or to go ahead with a purchase now. After deliberation, we decided not to wait for Maruti's mini SUV's. Around the same time while we were waiting for Maruti's update in Auto Expo, Mahindra had launched a revised version of XUV and this made us give XUV a serious consideration. Firstly went through the entire XUV niggles thread, it gave some confidence that most of the initial niggles are sorted out. Next went through numerous ownership reviews on TBHP, reviews were a mixed bag. However mind was fixated on XUV, thought will go get a test drive. Mahindra Sireesh is the dealer located nearest to my house. I was bit apprehensive about dealing with them reading negative reviews about their after service department on the forum. However after discussing with TBHPians Chuchan and Balan, who had purchased their XUV's recently from them and as both of them had given positive review of the place, went to Sireesh and talked to the same sales manager Chuchan had made his purchase through. Sales in-charge Ashik explained the features of the vehicle and seemed a very honest and straight forward person. However since it was Saturday evening all test drive vehicles were out, hence was promised test drive at my office or residence on Monday. Impressive. This is the newest dealer in Bangalore, with quite good after-sales reviews. Went to their Bannerghatta road showroom, filled up the Mahindra questionnaire with customer profile and request for test drive. Promptly an XUV is arranged and it is not a test drive vehicle, alarm bells are ringing in my head. 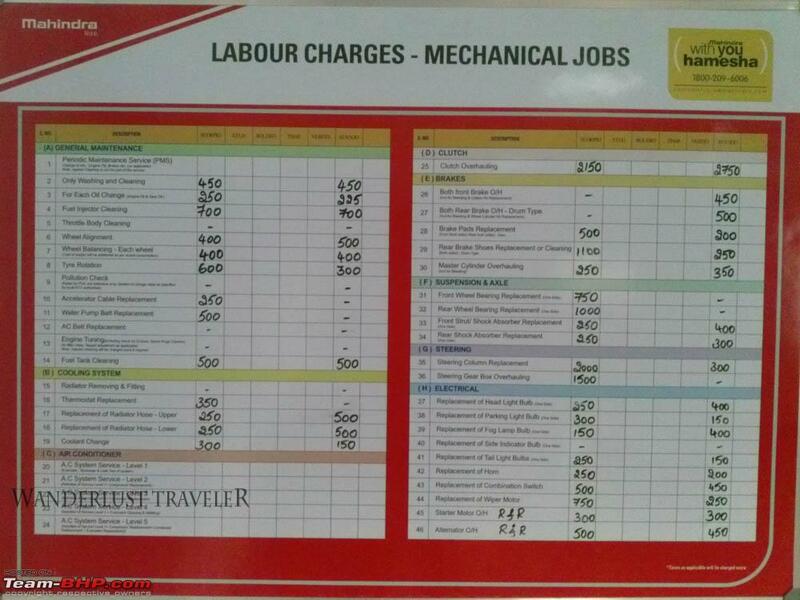 Checked with the sales in-charge if this is a customer vehicle since both sales and service centre is in same location. He replies in negative, says the vehicle belongs to the showroom manager and since the test drive vehicle is out this is assigned. I checked the interior of the vehicle, there are few magazines in backseat and also fresh garland around idol on dashboard. Vehicles taken for service usually do not have these both , so I believe the sales in-charge's word. I have never driven an XUV before. 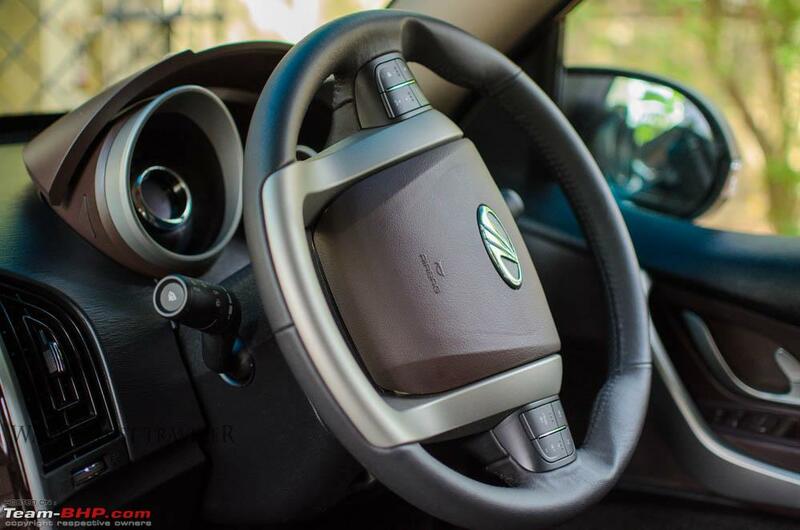 As XUV shares the same engine as Scorpio, I was expecting similar engine response and gear shifts and in spite of going through numerous ownership reviews, I was in for a pleasant surprise. The vehicle handled almost like a car and power delivery was linear. Checked the other features and functions, apart from the very cheap quality plastic with even cheaper looking texture everything was impressive. Discussed with sales lead Praveen about final price and discounts, the rate quoted by Anant cars were about 3 K more than what Sireesh cars were quoting. However I was keen on getting insurance from any public sector insurance provider for vehicle. Only Anant cars were able to arrange the same, hence in-spite of the 3K increase in price decided on booking the vehicle with them. I will be spending more time inside the vehicle than outside, so first criterion was to get dark interiors. I am not a fan of beige and also I feel the darker color hides the cheapness of plastic to an extent. Interior color selection finalized, it was time to think about the external color. 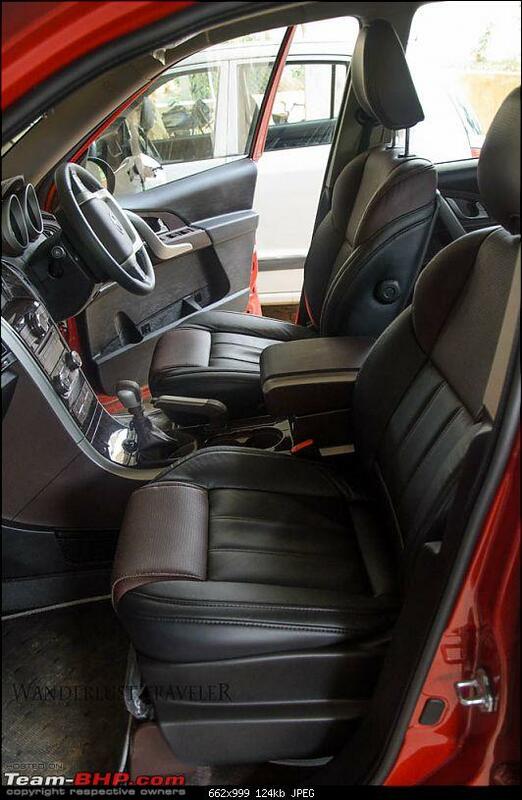 XUV comes with Opulent Purple, Moonlight Silver, Dolphin Grey & Tuscan Red when interior color is dark. In these, I felt Opulent Purple looked dual color in sunlight, hence dropped the same. Didn't like the dolphin grey much, and moonlight silver was bit too common. 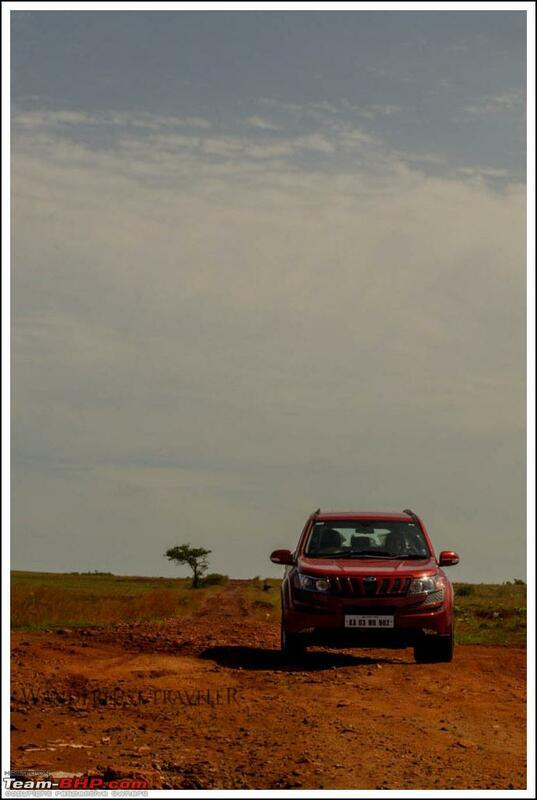 Also, two ownership threads on TBHP, SDP's and Mudhalaipatti's made me interested in Tuscan red. Variant selection was bit tougher, initially I was keen on W4 since it is a good alternate for sedan or crossover in that price range. However W4's come only with beige interiors and felt bit too skimmed on features. W6 was the next logical selection, however on deliberation, thought extra 2 lakhs will be worth for W8 considering additional airbags and more importantly ESP. Called up Anant cars and informed them about our plan of booking W8 - Tuscan red, also I was adamant that I wanted vehicle with Bridgestone tyres since there was discussion that the persistent left pulling issue is more in JK tyre. Sales agent informed it will not be possible to change the tyres and since XUV comes with three combination of tyres (Bridgestone, JK & Apollo) he said there only a one in three chance, however they readily agreed that I can either wait for another lot of vehicles to arrive if all the Tuscan red XUV's in initial lot was of non- Bridgestone tyres. I was happy with this arrangement. Their sales guy came and promptly took the cheque and handed me over the booking docket. All verbal discussions were entered in the docket as proof. I was informed it will take around 10 days for vehicle to arrive at yard once they place order to the factory. Next day of making the booking, I get a call from the dealer saying the vehicle has arrived. Shocked I ask how the vehicle will reach in a day. Seems the dealer was not knowing I had checked the stock with sales in-charge three days back when I went for test drive. Now the dealer is in denial, he says the vehicle was in transit that time and now received at dealer so I need to make rest of the payment. I was very sure this is also not true since the dealer system shows vehicle status (VIN, Engine no etc)from the date it has left the factory, meaning it would have shown when I went for test drive unless Mahindra is sending XUV's in air-cargo with overnight delivery. So I remain adamant that I will not make any payment without seeing the vehicle. He says something about some dealer rule of not possible to show the vehicle without making payment and all. However later he says he will check and call in sometime, which never happens. Sixth day of making the booking I get call that vehicle is ready for PDI, reach showroom promptly and did a PDI. VIN shows the vehicle is May manufactured and all functions working fine. 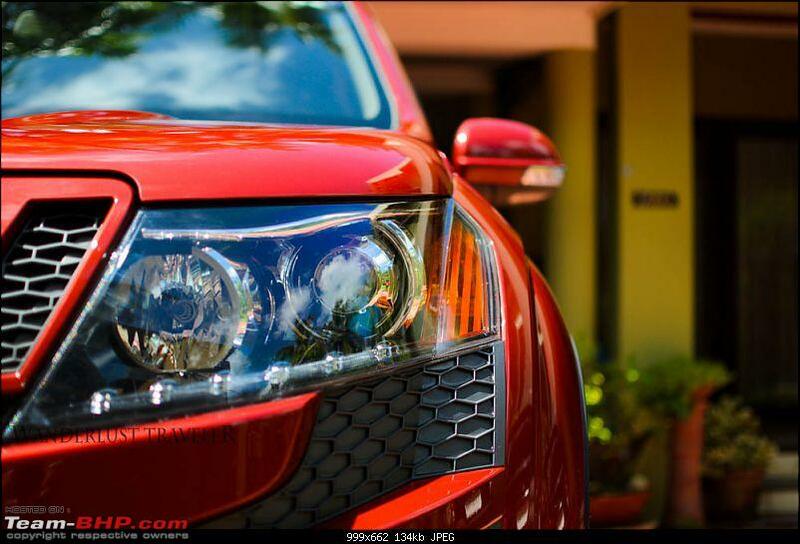 During check saw the glue on XUV and Mahindra badging on rear door was applied very shabbily. Dealer promised it will be cleaned before delivery. Checked the tyres and made sure all 5 are Bridgestone's. Checked the battery, it was of Amron make, XUV comes with two OEM battery - Amron, Exide. 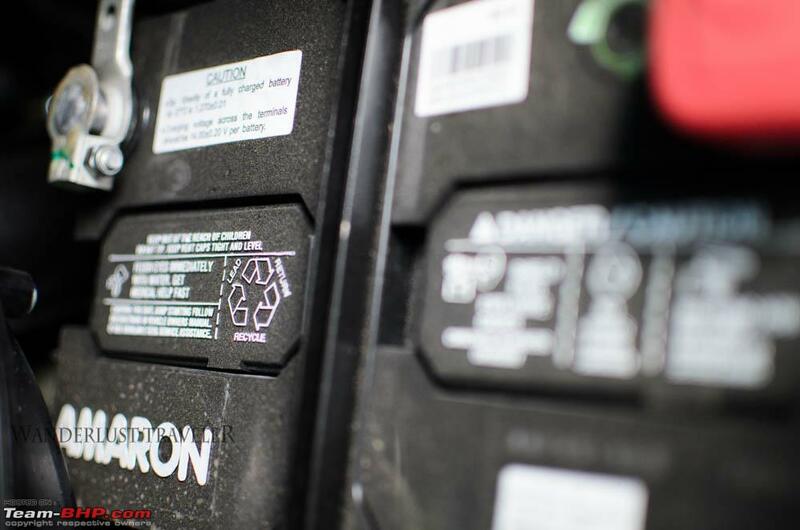 I was inclined towards Amron since reviews of the same are better than Exide. 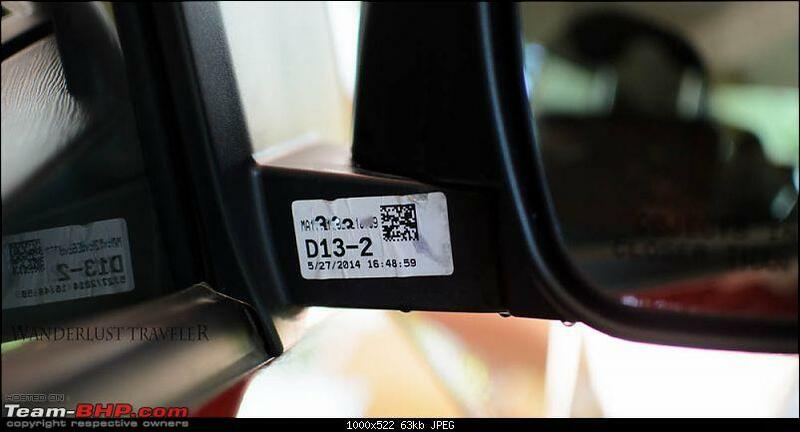 While checking the vehicle noticed that along with VIN there is a date stamp on ORVM. I guess this is the time vehicle rolled out of the factory. 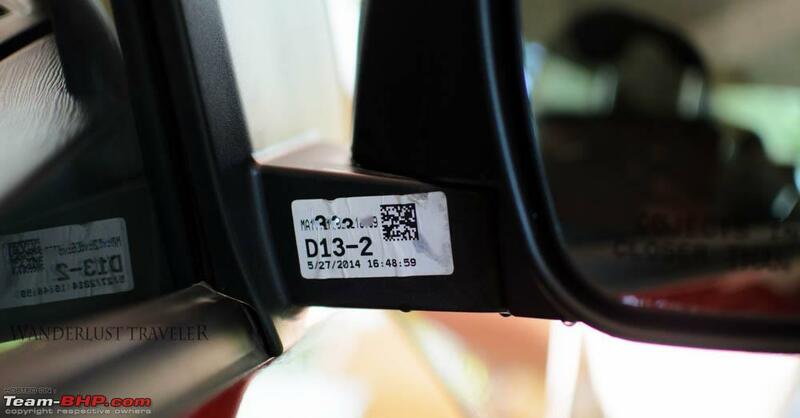 It is a much easier way to estimate the production date than to decode the VIN. Remaining all checks fine, we decide to make the remaining payment. Dealer informs it will take 3 days for clearing of the cheque and another one day for registration. As promised the registration got done within 4 working days after handing over the cheque. Since the dealer is located some 20 KM's from my office, decided to take half day leave and head over to dealer the next day. Had informed sales guy beforehand and they were ready with all papers and vehicles by the time we reached. They explained different booklets and vehicle features and the Cheetah was OURS. 1. Factory painting had some air bubble kind of imperfection near right wheel arch. There is no dent, hence I am almost sure it is a manufacturing defect and not something happened from the dealer. Mentioned the same to sales guy who promised to get it repainted during first service. Not sure if to repaint or leave it that way worrying about the finish that can be achievable from dealer side. 2. Dealer has used diesel instead of dashboard polish in interiors resulting in a stinky glazy film of oil on all parts inside the vehicle. They didn't have much of a solution to this, the cleaning cloth they came up with was again dripping in same liquid, hence decided to clean the interiors myself later. 3. Glue marks on rear panels not fully gone. Dealer did another round of cleaning and got it fixed. 4. Had specifically asked dealer not to put any stickers. However found their stickers on both the number plates, rear windshield and fuel lid. Was not sure how they will remove it, worried that it may cause some damage, decided to leave it that way. The stickers are removed now by me with help of windshield cleaner liquid. All done, drive off from the dealer with a wide grin. The whole delivery process took around 2 hours. Had received a 10 liter fuel voucher from dealer, filled up from the bunk and head home. Had an earlier commitment for the evening, hence was not able to drive the vehicle much in the evening. Initial price quoted by dealers were in range of Rs. 16.9 Lac, however without any negotiation both the dealers were ready to give discounts to the tune of around 50K. This 50K include discounts by both dealer and Mahindra.From price quote obtained from other TBHPians and on discussion with dealers I felt that the discount amount is mostly remaining the same since past few months. Based on each months offer the name of discount is changed, while I was doing test drive it was called as some special discount, later it was free insurance and I guess now it is monsoon offer. 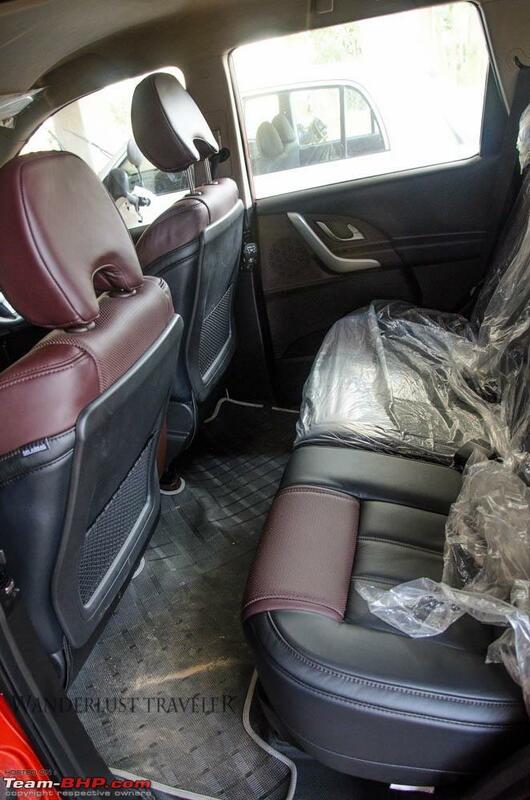 After lots of haggling the price agreed up on by dealer was 16.30 Lakh. Freebies: Dealer readily agreed for floor mat as freebie, apart from that they were not ready to give any thing else. 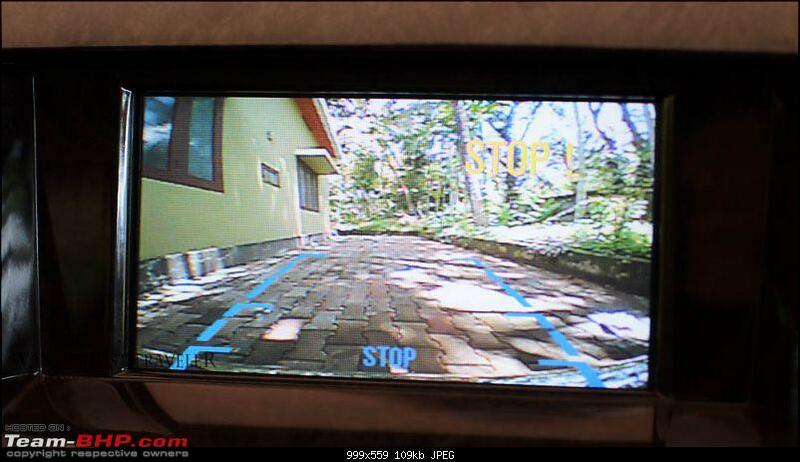 Accessories: Rear view camera - Rs. 2700. Body cover - Rs 1300. Total cost : Rs. 16.38 Lakh. Apart from this I got 3D floor mats for Rs. 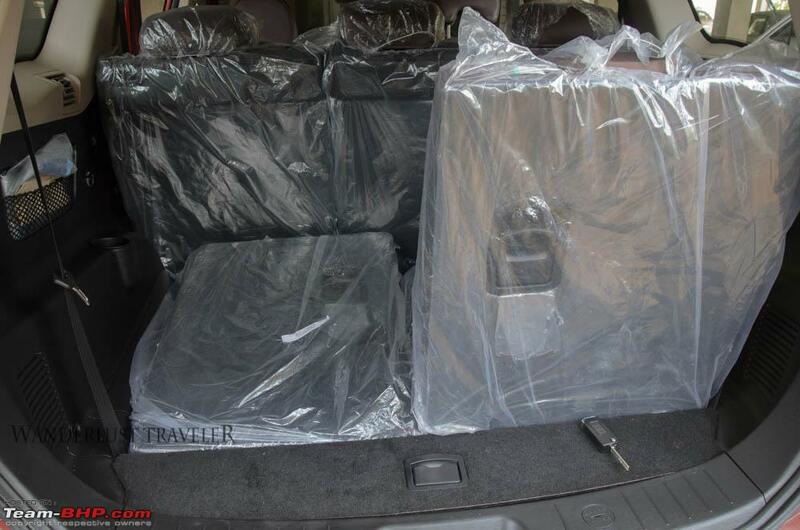 7500 from car accessory shop here in Bangalore, pics of the same later. Wake up the next day early morning and head of to Hessarghatta grass lands near to Bangalore for a photo shoot. 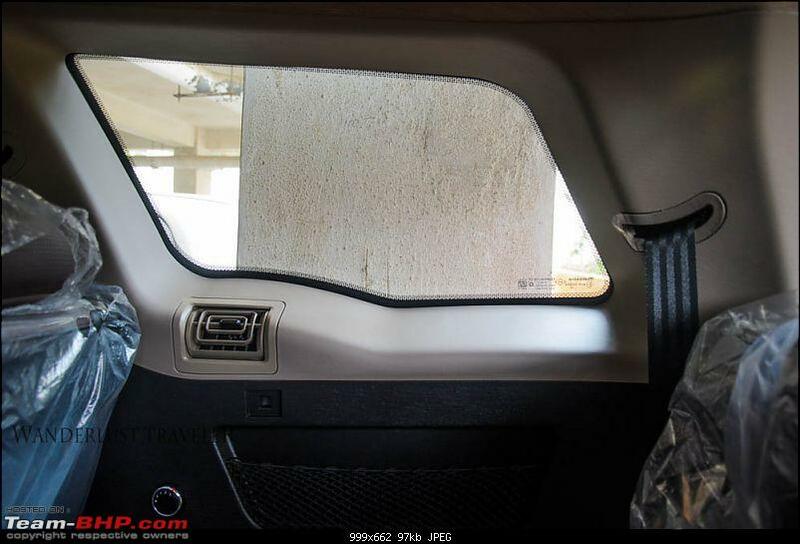 Sound insulation - All windows rolled up, music in level 2- 3, you will be hard-pressed to hear honking from other vehicles. Initially I was thinking the XUV has a weak horn until I checked the same after rolling down the windows. Expressway stability- High speed handling is superb for an SUV, was able to check the same on NICE expressway en-route to Hessarghatta. Also steering feedback is good, though I would have liked it to get a bit more heavy during high speeds. Driveablity - Engine response is superb, turbo lag is minimal and M hawk has sufficient grunt even in 6th gear for executing an overtaking maneuver. I am still getting used to 6th gear and also the position of reverse gear (located above 1st gear). In highways I find 5th gear use limited, you are either in 6th or if some you encounter any traffic you shift down to 4th. It is in city when you find the 5th gear more useful; i.e when you find any empty stretch. Another thing is when the RPM falls down and you are still holding a higher gear you feel the vehicle accelerating by itself a bit. I guess it is some anti-stall mechanism. This is noticeable when say you are in third gear and you slow down for traffic, as soon as you lift your foot from break you can feel the vehicle gaining speed. I was taken by surprise initially, now after getting a feel of gear-speed ratios I down shift to avoid this. Clutch - Clutch travel is bit too long, though it is smooth. Gear change is bit notchy and takes time getting used to, especially for changes between gears 1 & 2. Rearward visibility - Small viewing area of rear windshield means the interior rear-view mirror is not of much use, thankfully ORVM's cover a huge area of view. On the flip side due to wide angle of view, objects in ORVM's appear very far away than it is actually is. 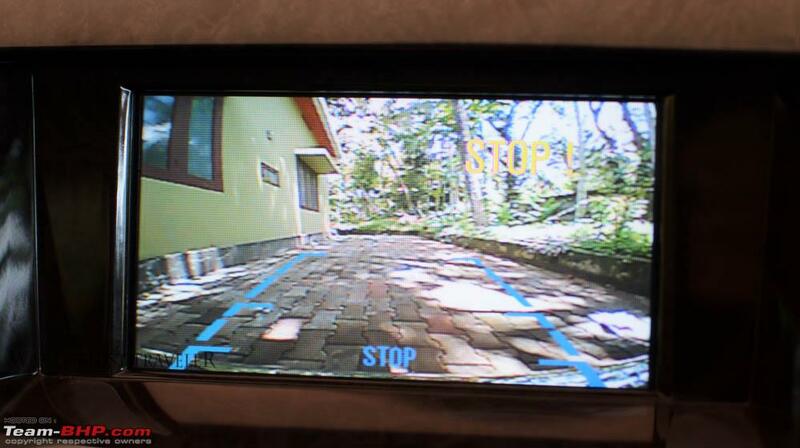 Now, I am using both interior and outside mirror to gauge the distance. Guess it may take sometime getting used to it. 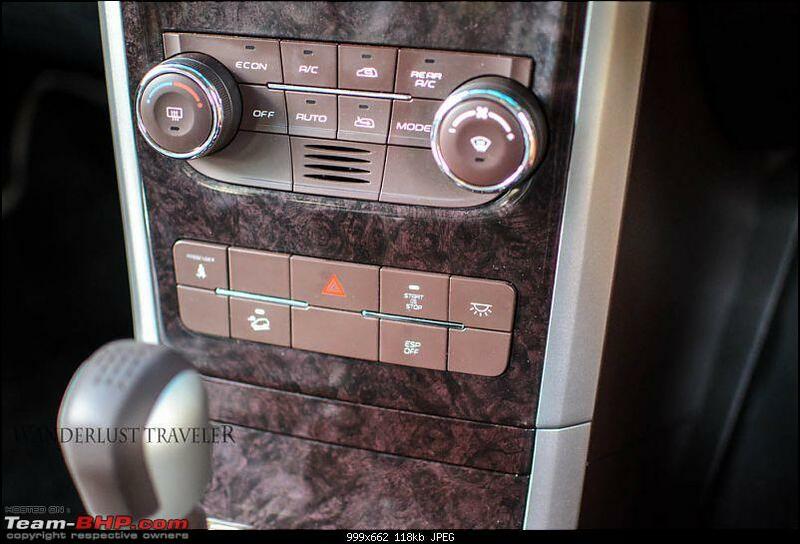 Infotainment system - W8 comes with touch screen infotainment system. Sound quality of is strictly average, I am not much in to playing music while driving hence I will not be making any changes to speakers. The system pairs with phone quickly, it is possible to dial number from the dial-pad on touch screen or re-dial from the call lists once phone syncs with the system. Navigation which comes with Map My India maps, latches on GPS fast and works great, however the user interface of the system is bit confusing. 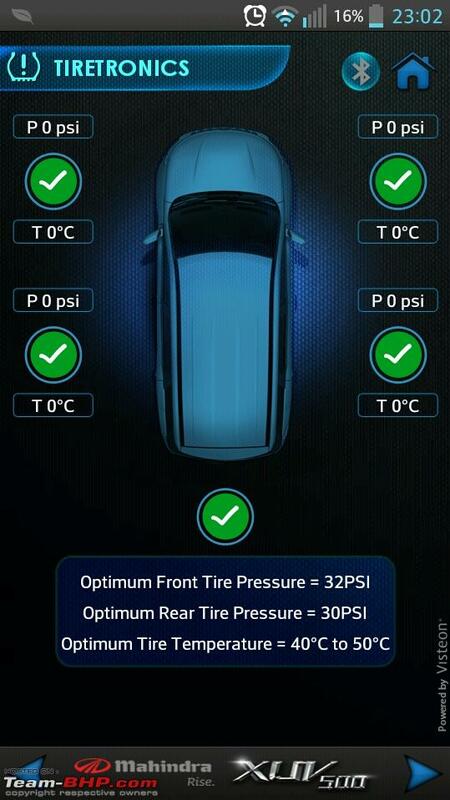 System also displays tyre pressure, door ajar warning & service warning. The displays is connected to reverse camera and displays its input when reverse gear is engaged. Found the mileage displayed to be fairly accurate based on my calculation. I am yet to do a tankful to tankful method to check the mileage, may be will do the same after first service. 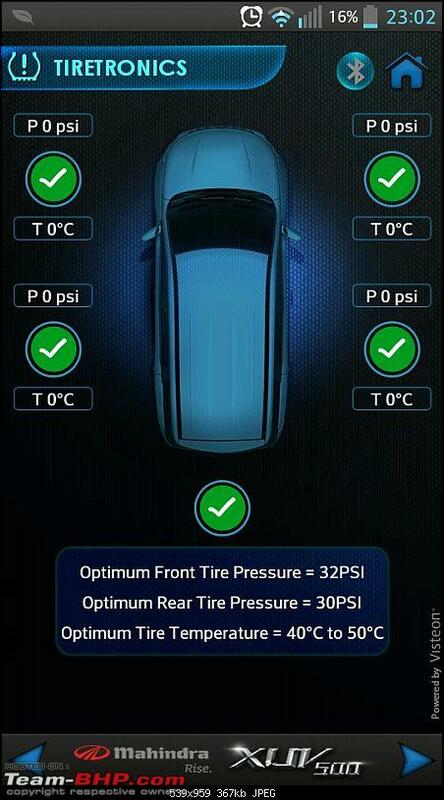 Tyre pressure displayed in infotainment system. 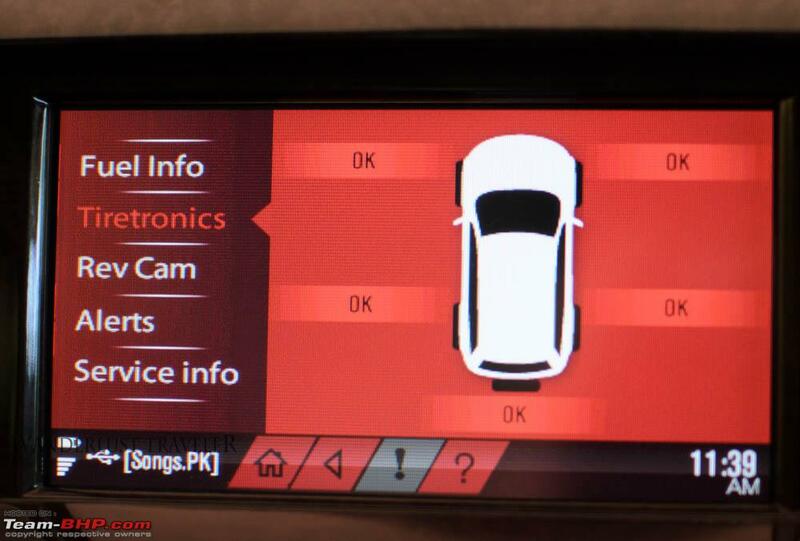 Infotainment system only displays 'OK' when pressure is in desirable range. Insert the key and diwali lights turn up. Overall cheapness of interior parts - Plastic quality of all interior panels are pathetic, the weird texture of the plastic does not make it look any better. Even the seat belt and buckle feels cheap to hold, compared to the ones in my Alto. 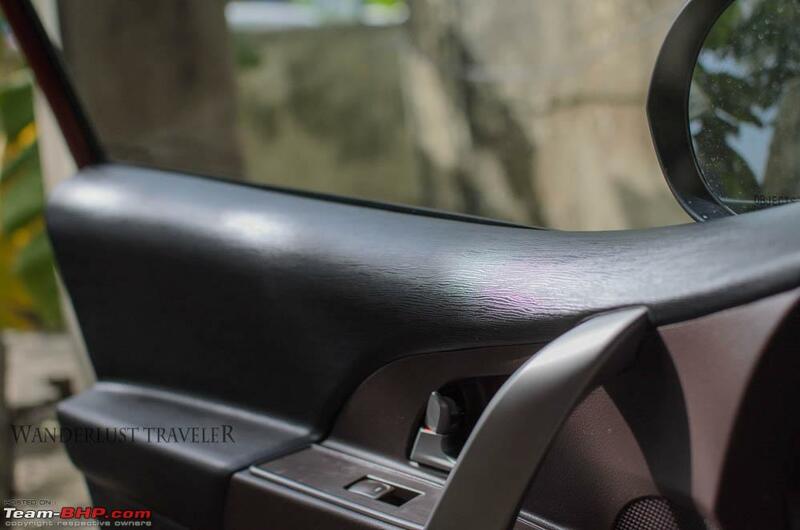 Unlike dashboard plastic, steering plastic and leather wrapping is of top quality. 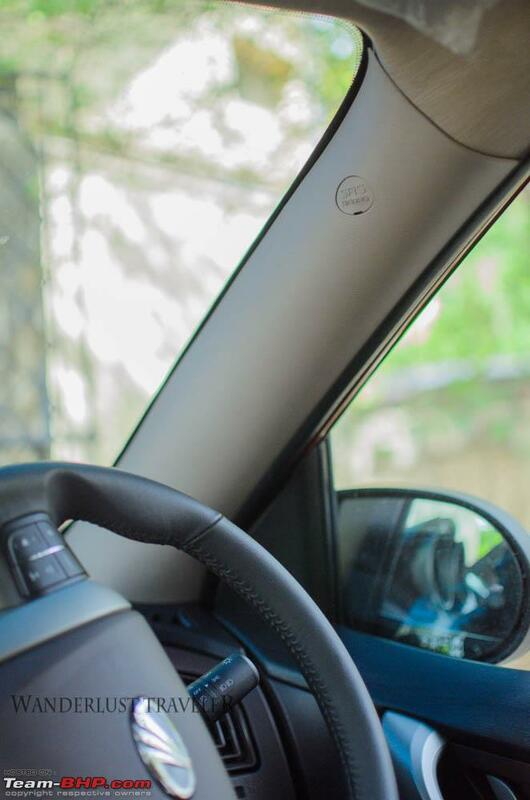 Steering mounted controls - Steering has controls for attending calls, changing music volume, cruise control and speech recognition. Speech recognition is bit tough to use, I guess it is easier to make the required change by the touch screen than speech recognition. I am waiting till running in period is over for testing cruise control. Breaking - Bite of the break or lack of it has been discussed at lengths at XUV forums here. The break pads on my vehicle are the latest version by M&M, which are supposed to have better feedback. Though the breaks has good stopping power, I would have liked the pedal to have better feedback. It took me few days to get used to the pedal feedback. Tyres - As mentioned earlier I had specifically requested for Bridgestones, they offer adequate grip. However one issue I found is that they tend to squeak badly at slightest of reason. Visibility - Thanks to high seating position, you get a good view of the road and the hood. However sideways visibility is hampered due to thick A pillar. 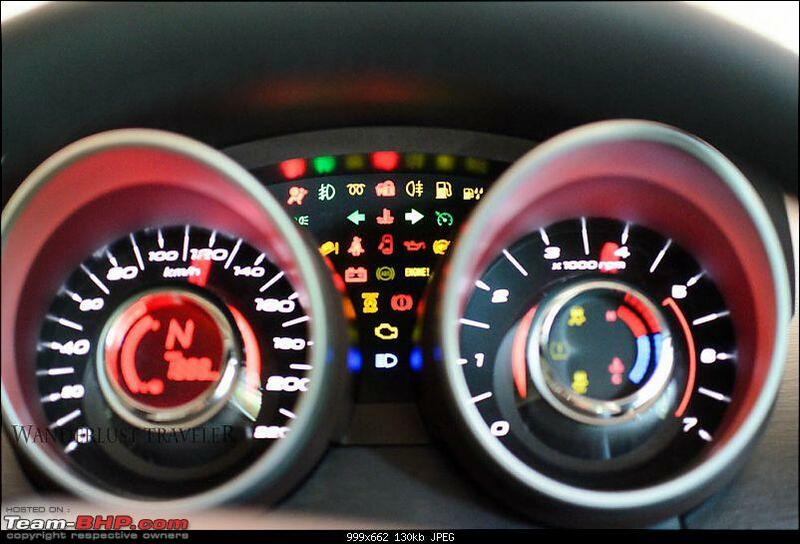 Another irritant is light reflecting from the shiny dashboard console. Mahindra should have changed the design by now. Though I have got used to the reflection from sunlight from the dash, however I still get startled while passing below street lights and lights are reflected on the windshield. Start-Stop function - By default this came switched on. However in the Bangalore traffic while driving from dealership to home, vehicle was switched off more time than ON. I was not comfortable with the AC blower running while the engine is switched off. Some 5 KM's into the drive, switch off the function and it has not been turned ON yet. Control switches for Hill Descent, ESP and Start- Stop. 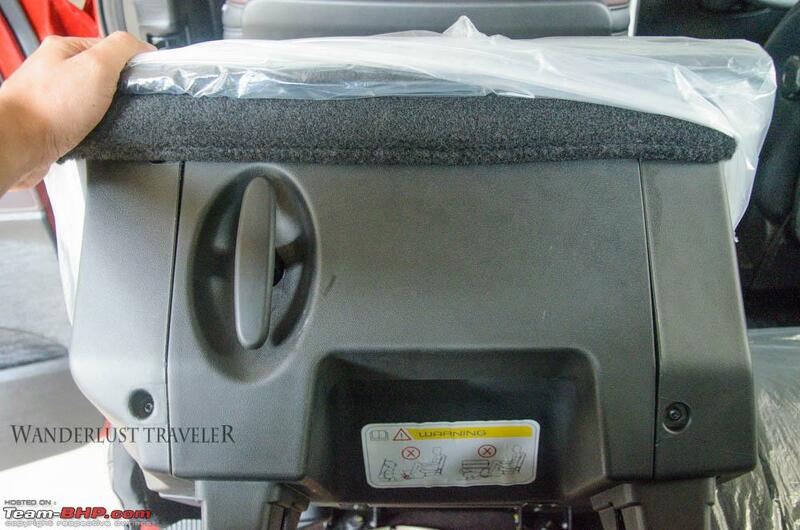 Air-conditioning - AC is a chiller, though due to the larger area of the vehicle it takes time to cool the cabin. During a typical sunny day in Bangalore it takes above 15 mins to chill the entire cabin to the desired level. AC control knobs can be seen in pic above, the temperature setting and blower speed is displayed in infotainment screen when any change is made. There is a separate switch for Rear -AC, as per my initial observation switching ON the rear AC brings down the mileage by around 1.5 KMPL. Wiper and defogger - The arms of front windshield wipers are really long and OEM wipers do a neat job. Was able to test the wipers couple of times. 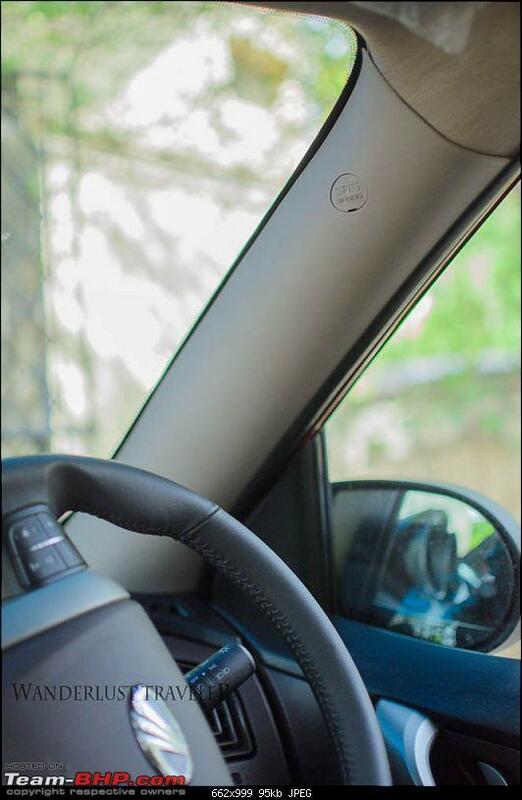 W8 has an auto -wiper function also, the same can be enabled by pressing a button on the wiper control stalk. The system is very effective and it controls speed of the wiper action based on intensity of the rain. However on the flip side the wipers perform a single wipe when the system is enabled, not a good thing to do if the windshield is dry. 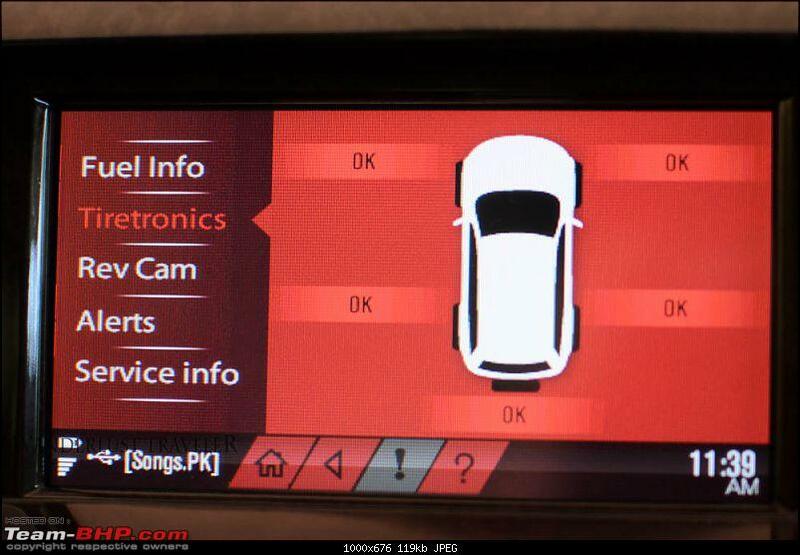 There is an indication on infotainment screen when auto wiper is ON. M&M should have stopped at that and avoided the wipe function. Auto Wiper function switched OFF each time you turn off the engine. Tested rear defogger during recent rains in Bangalore & Chennai along with rear windshield wiper, both works very effectively. However view through rear windshield is anyways restricted in XUV and rains just add to the woe's. 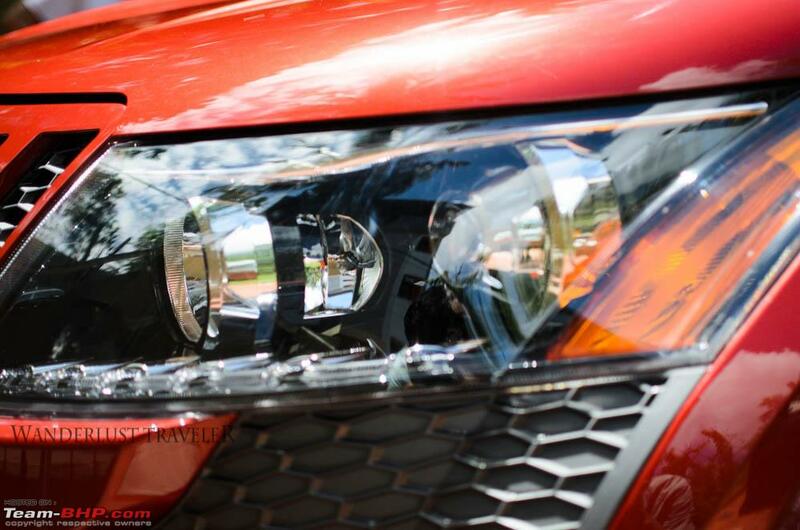 Headlights - Headlight console consists of 4 sets of bulbs apart from indicator. There are separate bulbs for low & high beam, another bulb for what M&M calls as static bending lights and a set of LED's which are called parking lights (and not DRL's). The LED's are bit bluish for my like, I like the warmer shade of BMW's. The high beam is powerful and I find it sufficient for night time highway cruises. 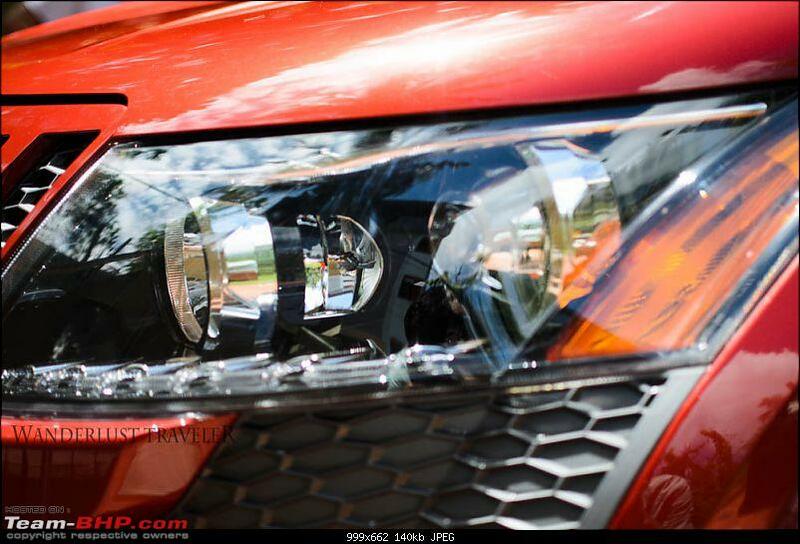 For me headlights are the most beautifully designed part in XUV. The low beams I feel has insufficient throw area, I find it sufficient for usual city rides over familiar roads. However low beam is not confidence inspiring, a slightly longer throw area would have been better. Static bending lights works like a charm, however it took me few days to get used to the sudden switching ON and OFF of this additional light. First time I thought some vehicle was coming past the turn when the lights switched ON suddenly. Static bending lights can be seen sandwiched between low and high beam bulbs. In addition to this, W8 has fog lamps as standard fitment, I guess it is more of a fashion statement than of any real use. Also, W8 comes with auto headlights, control for the same is on headlight control stalk next to steering column. As mentioned earlier, I am not a big fan of 'Auto' features, hence switched if OFF after making sure it works. Boot Space - The boot space is small even to keep a boot. Hidden below boot space is tool box. Third row seats are not used frequently by us, so planning of keeping it folded down always and get 3M mats which will cover the entire area. 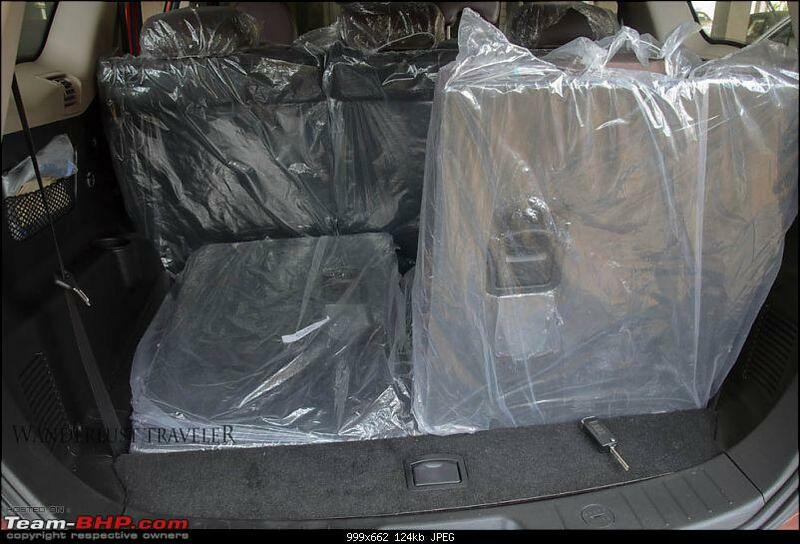 Seat folding is fairly simple. Both second and third row seats can be folded in 60-40 configuration. Pic with one seat folded, please find the key to get an idea of boot space. Driver seat in W8 is three way adjustable. 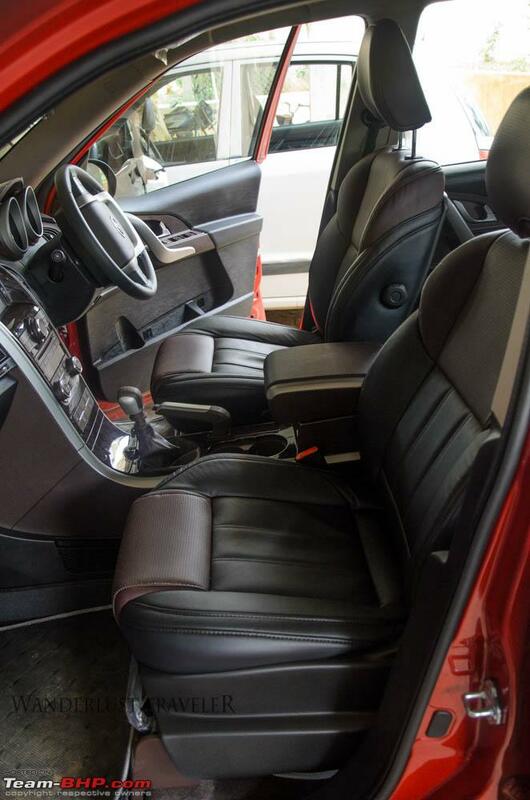 Seat travel is real good and along with steering adjustment it is easy to find a comfortable seating position. Seat leather quality and under thigh support is also good. The dial on seat back seen in pic is used for adjusting lumbar support, I am not able to find much difference in changing the settings though. Second row seats has ample leg room, infact M&M should have moved the second row bit forward and freed some space for third row. Better still a sliding row would have been extremely useful. 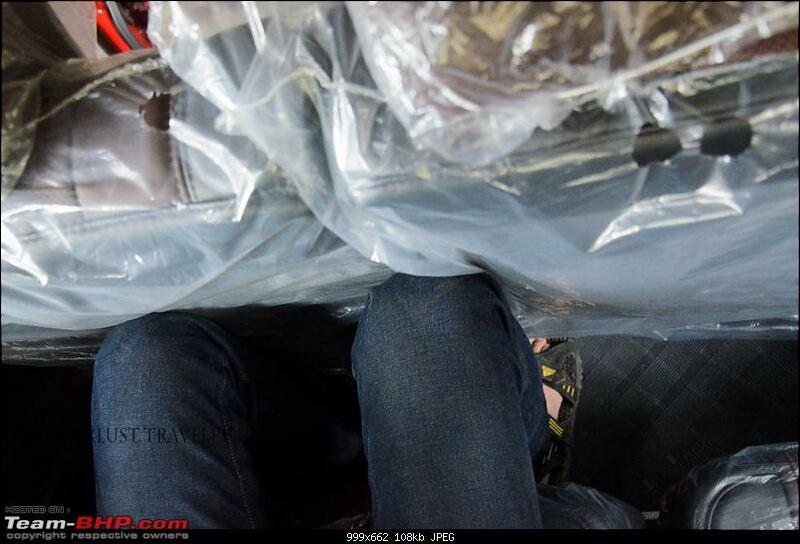 Some of the second row seat passengers have complained that they are not able find a comfortable head rest position. Third row space is very limited and an upright backrest adds to the woe. Its a tight fit for six footers in thrid row. While seated as in pic below, headrest fouls with your shoulder blade. This can be prevented to an extent if headrests are adjusted properly, however still backrest ends way too low for a comfortable seating position. 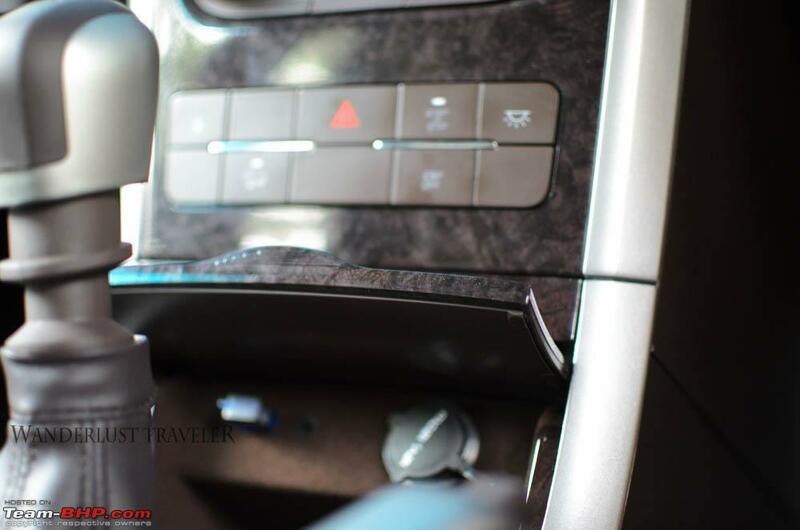 Third row passengers can fold second row by pulling this knob located behind second row seat. However a design flaw is that when seat is kept upright, panel on back of seat hides the knob. This makes finding the knob a bit difficult. Hill Hold function -This is an always ON feature, there is no option to turn this off and no notification if the feature is active. What this feature does is to keep breaks engaged for couple of seconds even after you take your foot off break pedal if the vehicle is on a slope. This helps in preventing vehicle from rolling backwards till you press the accelerator. 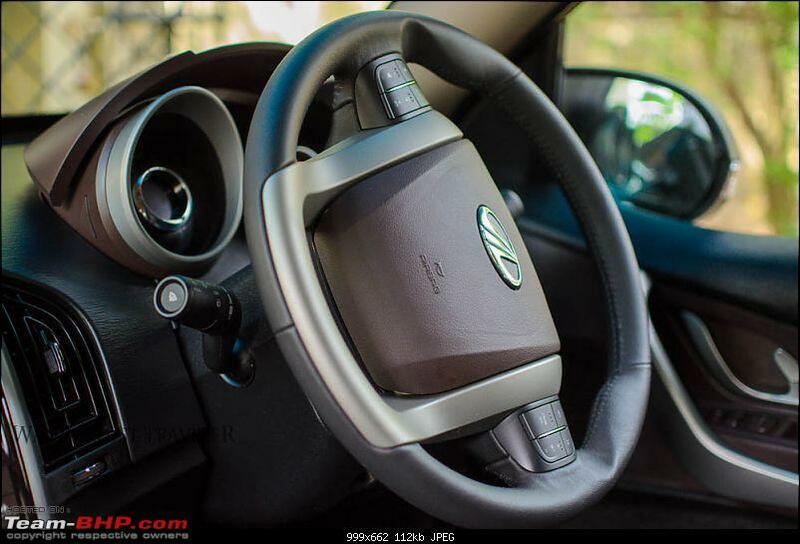 The feature does away need for using half clutch or hand break to prevent rolling back. However it takes few tries to get used to the feature, I am still learning to use it. There is an awkward second when you leave the break and partially disengage the clutch and the vehicle stays at same spot, do it too soon or slow vehicle stalls. Hill descent function -This feature is enabled by a button in centre console. 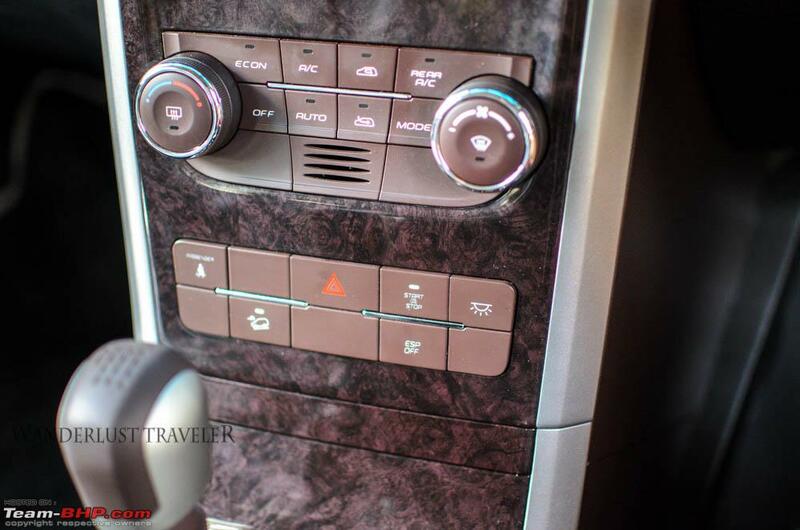 This helps in holding the speed of the vehicle to the maximum mentioned against each gear while climbing down a hill. If the speed was to increase than that rated for the gear engaged automatically, breaks will be engaged. Tried this on recent trip to Gopalswamybetta; a hill near to Bangalore and works superbly. However I am not sure how much I will be using this in future, reason is that I feel it is useful only if you don't have any vehicles ahead or behind you. On an empty slope you can leisurely slot the vehicle in any gear and enable the feature and rest your foot. With other vehicles ahead or behind you, be prepared to break any moment the vehicle ahead of you breaks or if you drive too slow the vehicle behind you will get impatient. Another issue I faced is that the function enable key has an LED which is not easily visible for driver in sunny condition. 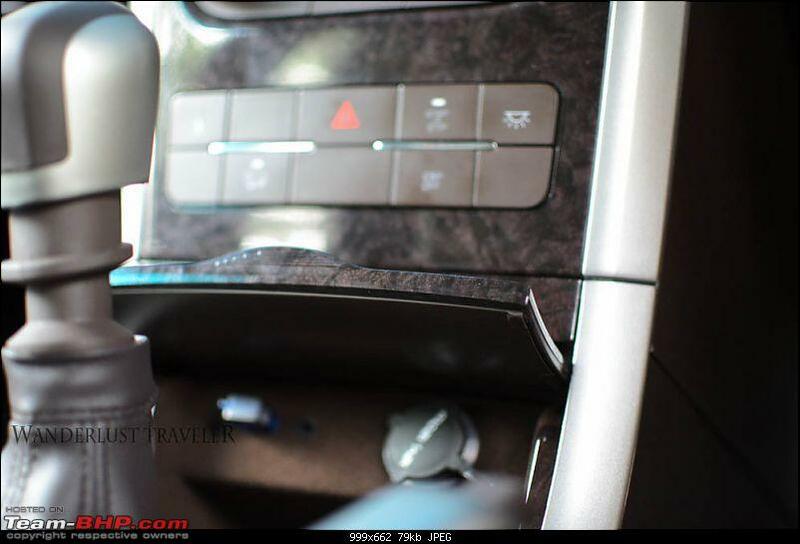 You need to cup your hand over the button to see if it is working, not a good design for a feature which is supposed to be used in hilly condition when driver is supposed to be all the more alert. 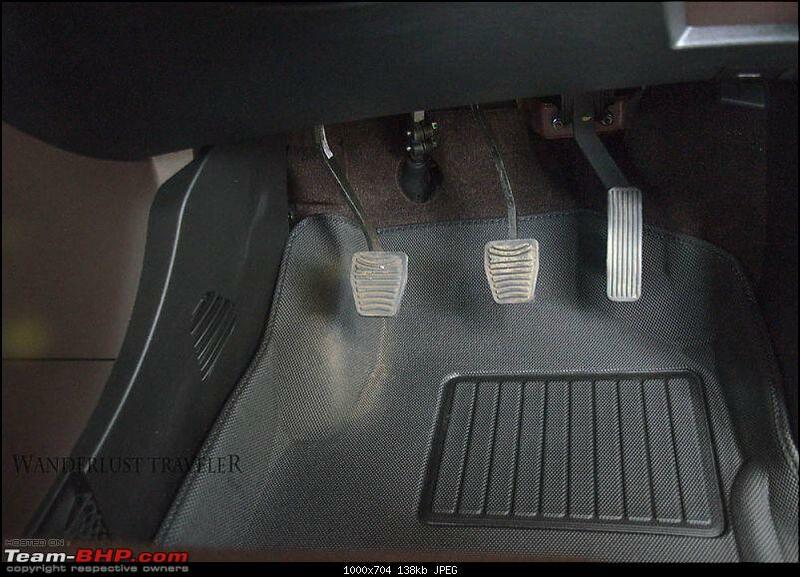 Foot well & Pedal spacing- ABC pedals are comfortably spaced and the foot well is clean with no wires popping out. Fuse box is also located here, I need to open and check the same sometime soon. 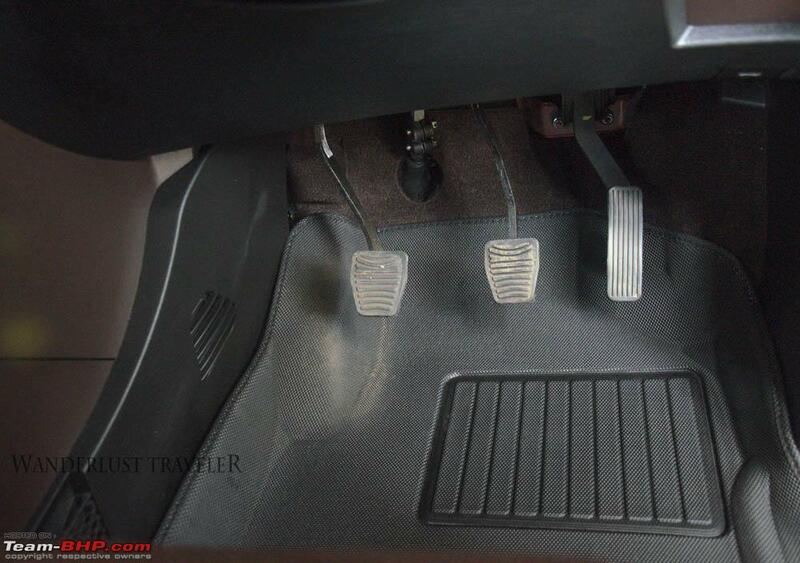 Dead pedal is partially eaten up by the flowing center console. The angle of dead pedal is good. However it takes an effort to get your foot, especially while wearing slightly bigger foot wear (mine is size 9) without getting stuck in clutch. 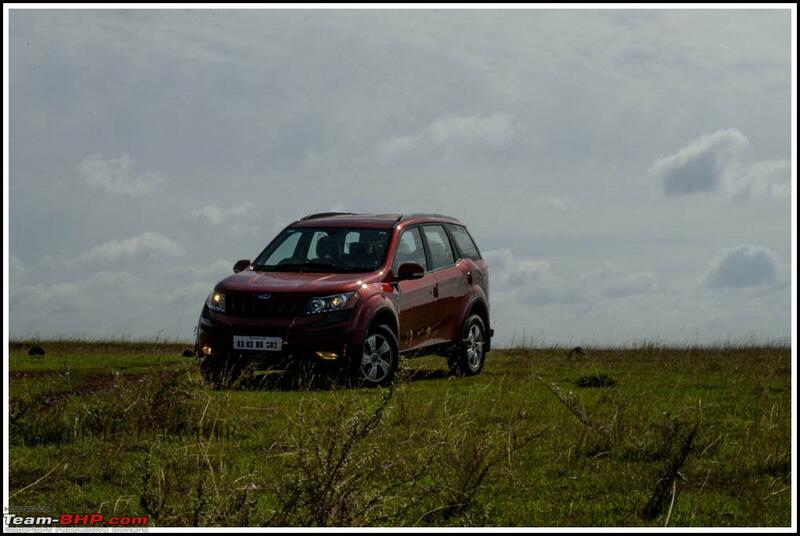 Mahindra experience - It is just couple of weeks in to ownership, hence I am not in a position to fully comment on the same. However based on my limited customer care experience I find it a bit unorganized, though I would give full marks to Mahindra for trying. Couple of instances -I get an SMS from Mahindra mentioning my RM's phone number, on checking it notice that the phone number is not RM's but mine itself. On a second instance, I get call from Mahindra about feedback on vehicle delivery, I complain about the paint bubbles and Diesel 'treatment' on my vehicle. I get a call from dealer in couple of hours asking me to bring the vehicle back for checking the same. Though I am happy with the way they reacted to the complain, I feel this issue should have been detected by dealer before delivery when their PDI was done. 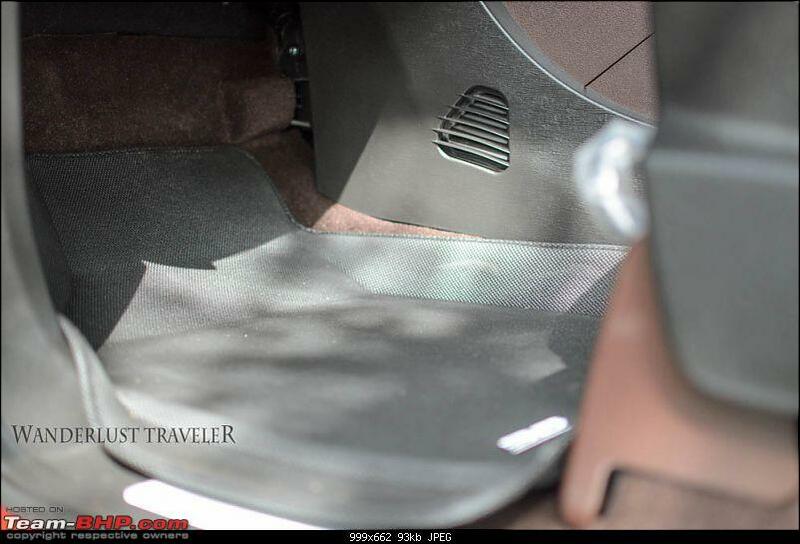 Apart from floor mat, dealer was only ready to give scuff plates as free accessory. Personally I didn't like the XUV branded plates, inspite of a long negotiation they were not ready to give either camera or rear bumper free. Finally had to purchase both, had to shell out 3K for camera and 4.5K for rearguard. Have to agree that rearguard spoils the looks by hiding the exhausts to an extent. However opted for the same to save the bumper from enthusiastic bikers. Alongwith dealer provided mats decided on getting 3D mats. After checking with few dealers online, based on TBHP recommendation decided on checking out HotTracks in Bangalore. Got the mats at 7.5 K from them, they fit perfectly and looks superb. Got a 4 GB pen-drive. Since longer pen drives will hinder in closing of the console lid, got the shorter one from FlipKart. Sorry for out of focus image. Last edited by mpksuhas : 28th July 2014 at 12:52. 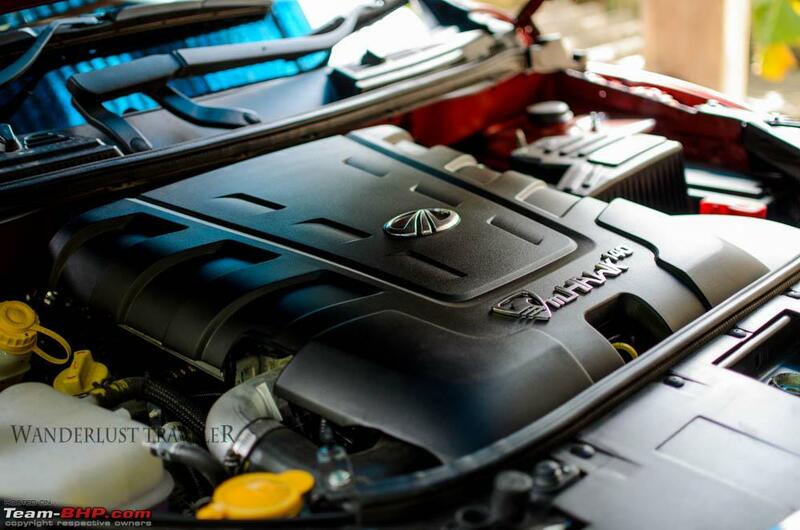 Maintenance - From the spare part rates mentioned by current owners it is sure that XUV will not be cheap to maintain. 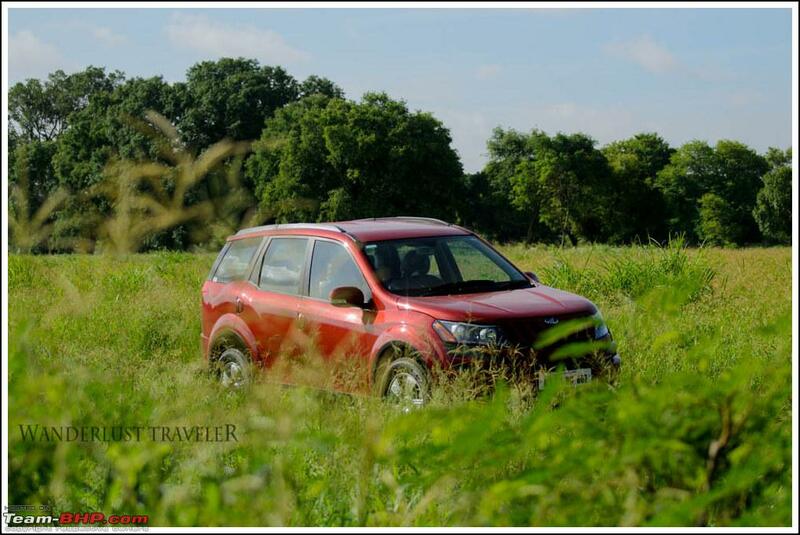 Recent update on official review thread is that Mahindra has come with an extended warranty package for XUV. I am planning of getting it later sometime, with standard warranty of three years and an extended warranty of 5 years hope to negate the expensive spare issue. 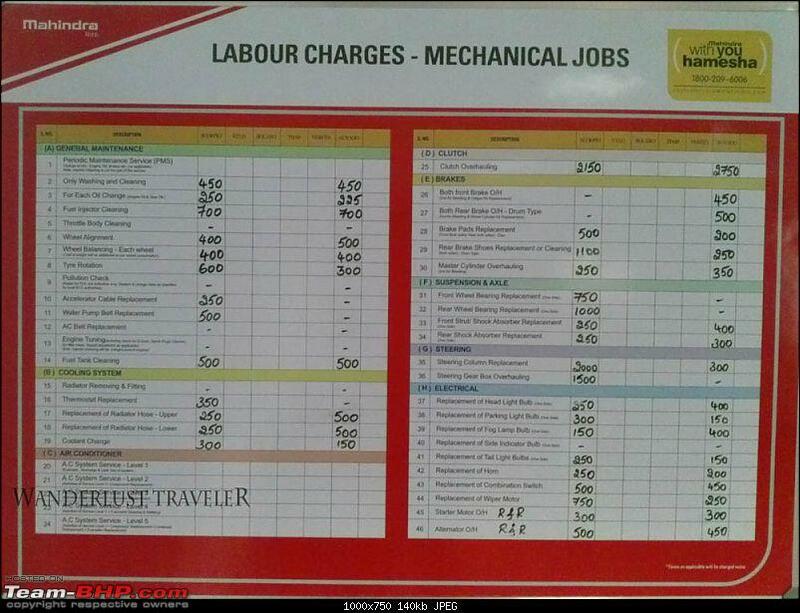 Labour charges mentioned in Mahindra service center (Anant Cars), I am not sure how updated or correct the information is. Along with the same there was part price chart also. However the same was having only half information updated and also out of the list of models only ones updated were of Scorpio & XUV. It's two weeks into ownership and have crossed 1300 KM's till now with around 90% of that on highway. Restricting myself to keep RPM's in 2000K range. I wanted to get engine oil changed at 1000 KM which I am yet to do. 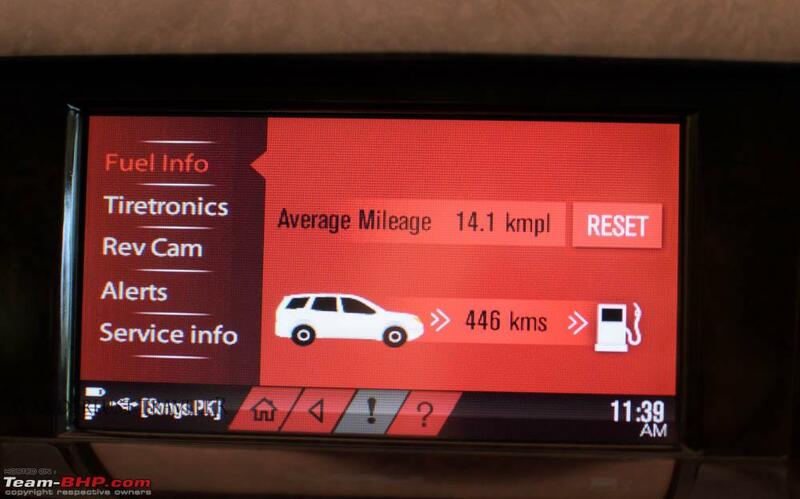 During Bangalore - Chennai drive infotainment system was showing a mileage of ~ 14.6 KMPL. I hope this will increase and settle down slightly above 15.5 KMPL after first service based on other ownership reports. 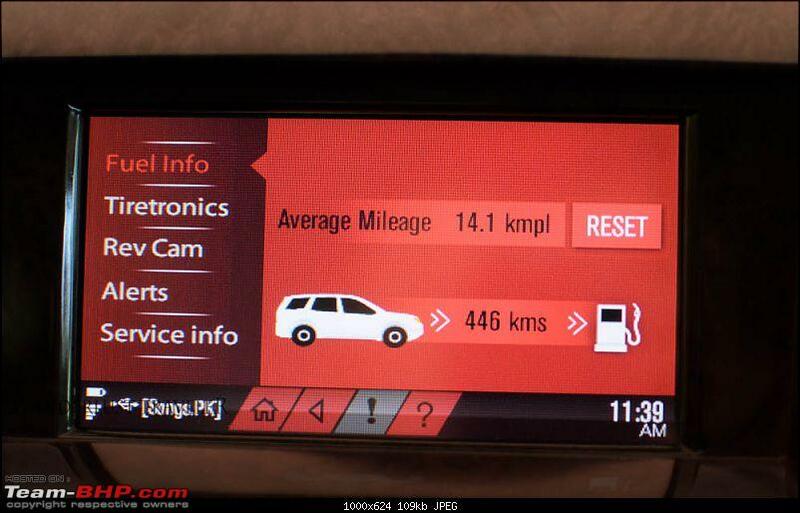 While AC is switched off and driving at 75 KMPH mileage is displayed around 17.9 KMPL. 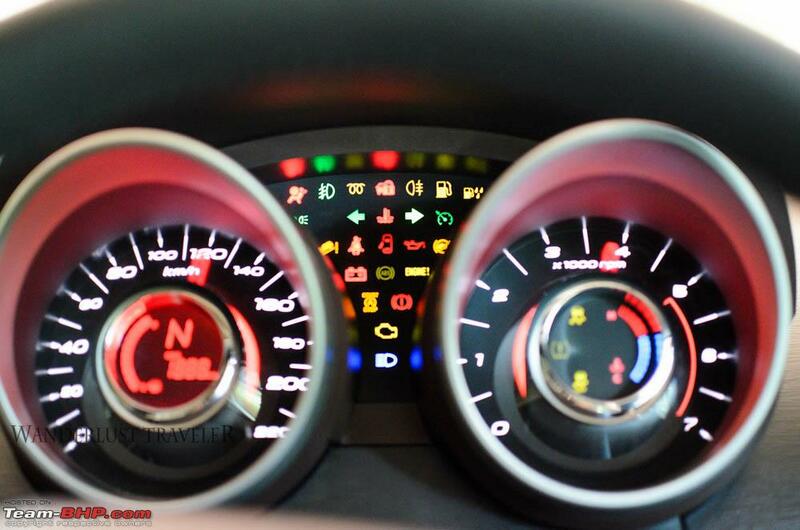 XUV has two fuel tanks placed below second row right and left passenger seats. Fuel tank capacity mentioned by M&M is 70 liters, I guess it may take another 3~4 liters more if you fill to the brim. The expression of a fuel bunk operator was to be seen when I asked him to fill 65 liters. Most of my drives are on highways since I use Alto for daily commute. However based on the limited usage in city I feel XUV can be a daily office commute just like highway runner. Superb driveablity on highway. Overtaking and maintaining triple digit speeds is piece of cake. Limited boot-space when 3rd row seats up. Cramped third row seats, it would have been great if second row came on slider rails. Glove compartment and other storage's are bit small in size. Metal heat guard on top of left silencer is rattling. I guess it is due to a loose nut, however unable to find the same. Vehicle tends to drift to left, need to get it checked when visiting service center for oil change. May have to repaint right quarter panel due to the air bubble issue. Dealer has promised on getting it done. Congrats!! So you got an Innova. Ohh!! You should have got an Innova. This looks just like Xylo. Is it capable of hitting 300 KMPH. You should have bought an - (Swift, Honda City, Amaze,list goes on). They give amazing mileage. Is it a Petrol variant?, you should have got the Petrol one. XUV niggles and solution thread. Ownership report by J. Ravi. Special thanks to TBHPian's Chuchan & Balan for helping with price negotiations. Last edited by mpksuhas : 28th July 2014 at 12:59. And a nice detailed write-up. Thanks, was about to PM you the link. Congratulations and wish you a happy association with the Cheetah. Liked your explantion of the car selection process. Many many congrats on the new buy mpksuhas. Wise decision to go for W8 I should say. Very wise. Thoroughly enjoyed reading the review. Would definitely serve a lot of purpose for those making a new buy. Ha ha. That's quite true. However, as you also know, the initial mileage of the niggles thread was due to some peculiar defects. 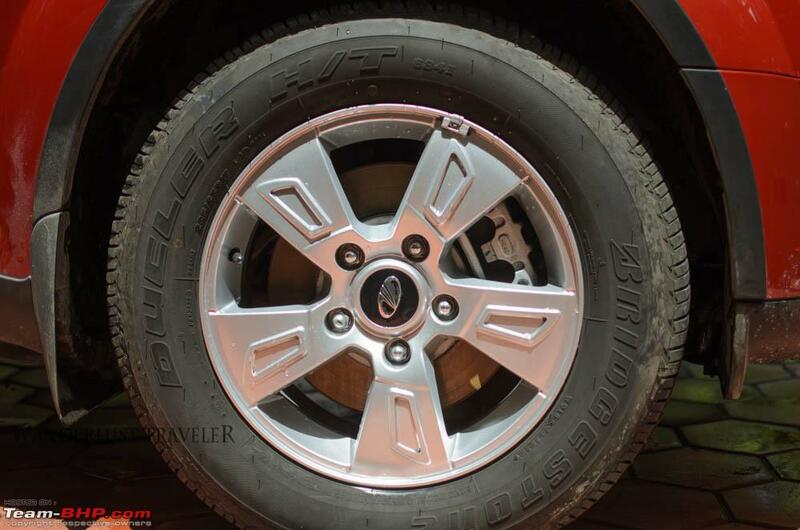 Those have been sorted out by Mahindra in the latest editions. Good thing that Mahindra is reading these online laments and making amends to it. Yeah, the pendrive slot is a sore thumb. I also bought a similar sized pendrive online. 8 GB in my case. Last edited by dhanushmenon : 29th July 2014 at 13:47. Congratulations on the new buy! Wishing you many many happy miles! Just one query, did you consider the Xylo in your decision making process ? Congratulations on your acquisition ! , Red, silver and purple are the best colors on this car. The new cars are more refined and niggle free. Though we recently sold our W800 which turned out to be a lemon, I just cant stop admiring this car. Wish you miles of happy and niggle free ownership! Many congratulations buddy on the super upgrade !! Very well written and described. I can relate so much to my first car buying experience 3years back. Although I was not very informed back then, but emotions were running high with each small thing !! The XUV5oo is one of my preferred upgrades, wifey wanting to upgrade to a sedan though. Long time to go, but I will keep an eye on your thread and refer to it whenever I go for an upgrade. Enjoy your drives. Cheers !!! Congrats mpksuhas! Very detailed report and comparisons. Lovely photos. Please post a pic of the rear, especially the bumper guard. Scuff plates are good to have(IMO a necessity) and prevents nasty scratches. Go for stainless steel ones if it is available. Door visors are also a good addition especially in KL and KA. How is the radio reception, especially in basements (considering internal antenna)? Any plan for a roof carrier? Congrats mpksuhas! Great attention to details. I myself am researching in the similar domain for an upgrade to an SUV. Your review thought process was helpful. Nice narration of the decision making process and wonderful pics. 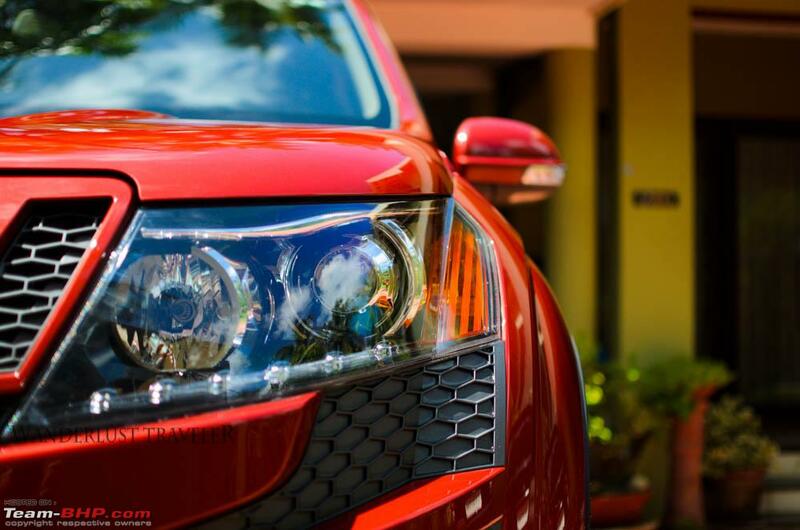 XUV500 is the original Indian crossover which looks at part with the global players. So, definitely a very good decision. Congrats! Thanks Dhanush. Yes, infact towards end of last year (just before revised version was released) a friend of mine was planning of buying XUV. I had brainwashed him not to go ahead with the purchase. He was when I told him about my purchase decision. I also bought a similar sized pendrive online. 8 GB in my case. I too had initially planned of buying 8GB, however saw few reviews saying infotainment system perfomace was slow with higher capacity drives. Hence opted for 4GB. Thanks Dieseltuned. Xylo and Innova was not considered seriously during purchase. I have felt Xylo was a VFM vehicle and similarly admired Innova for its no fuss ownership. However felt both were purely people movers, I was looking for a 5 seater only ( Initial selections were sedan's and Duster). 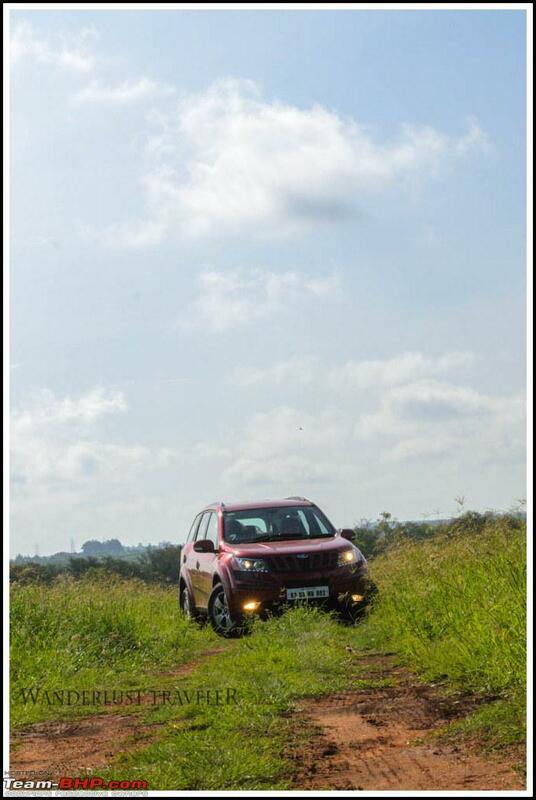 A major reason for going ahead with XUV was its driveability, safety features & highway manners. Red, silver and purple are the best colors on this car. Thanks. We were keen on red and silver. Opted for red since liked the color more and most of the XUV's I keep seeing here in Bangalore were silver. The XUV5oo is one of my preferred upgrades, wifey wanting to upgrade to a sedan though. Even my better half wanted to upgrade to sedan. I guess it may be due to a fear that SUV's will be tougher to drive around than sedan. Please post a pic of the rear, especially the bumper guard. I don't have a close up pic of the rear now. Will post it over the weekend. Should agree that rear bumper is an eye-sore. Scuff plates are good to have(IMO a necessity) and prevents nasty scratches. Go for stainless steel ones if it is available. Yes, even I wanted to. 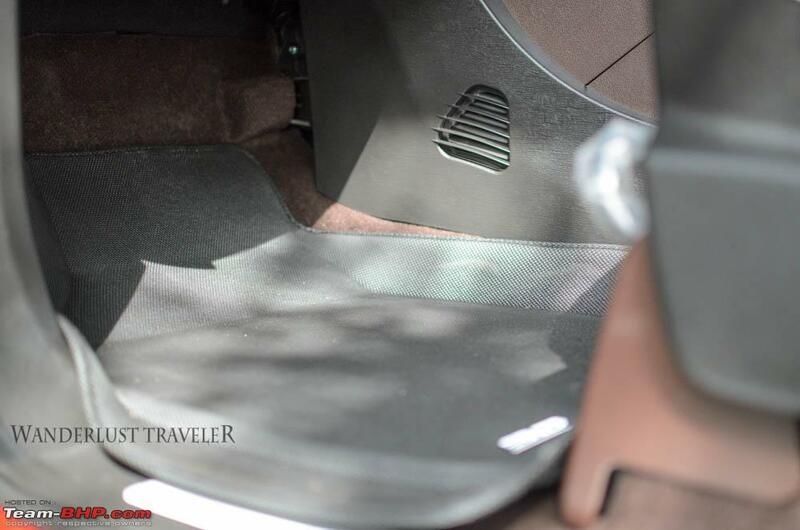 XUV comes with a small scuff plate. Dealer had earlier agreed for free sucff plates. However that too does not fit the entire area. Hence did not opt for the same. 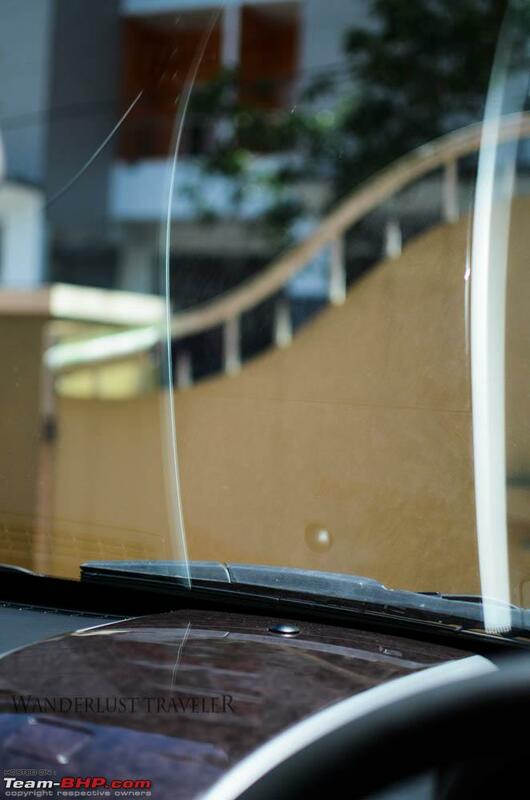 Door visors are also a good addition especially in KL and KA. My cousin had got this fitted in his XUV. However now after a year, he complains of rattles. Also, I mostly drive with windows rolled up, so it is not going to help in rains anyways. Radio reception is good. Last weekend during a trip I was able to get radio reception from Bangalore stations almost till Chamarajnagar (~150 KM). Roof carrier is essential if you have third row passengers during most trips. Mostly 3rd row will be unused for us, hence no plan on roof carrier as of now. Your review thought process was helpful. Rohansachar, glad that review was helpful for you. 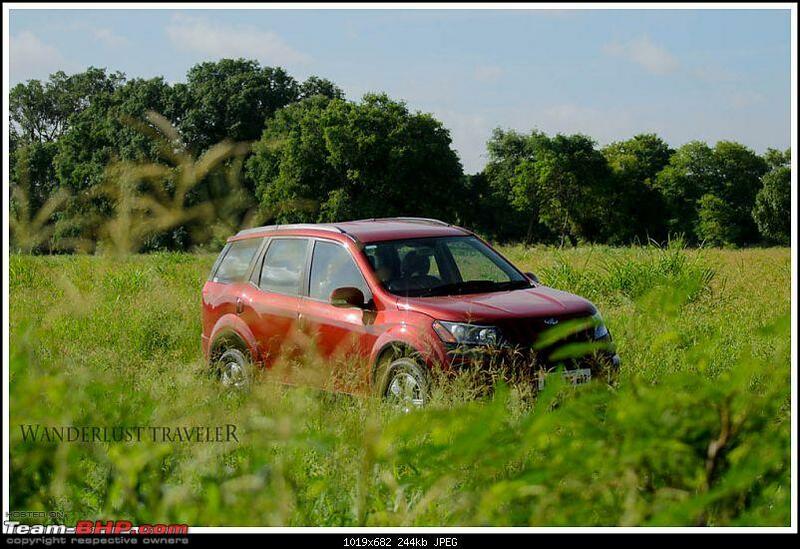 XUV500 is the original Indian crossover which looks at part with the global players. Yes, though it was not a primary criterion for selection I feel XUV is one of the most good looking vehicle in this category. Congratulations mpksuhas Neat and precise review. Was waiting for your review since you said about your acquisition on the test drive thread.